We took an all day round trip on the Frances Barkley, which is a small working ship which transports passengers and cargo along a route from Port Alberni to Bamfield on Vancouver Island. It is a true working boat that easily maneuvers around cottage docks to drop off fridges, mail, lumber and garbage containers to locals along the route. Unfortunately it was quite foggy on the day we had booked to sail but the scenery was still beautiful. The ship itself isn't large, but it has everything which is needed, including a cafeteria, clean washrooms, outside decks and indoor, comfortable sitting areas. The staff are friendly -the food pretty good, and the stop at Bamfield was lovely. 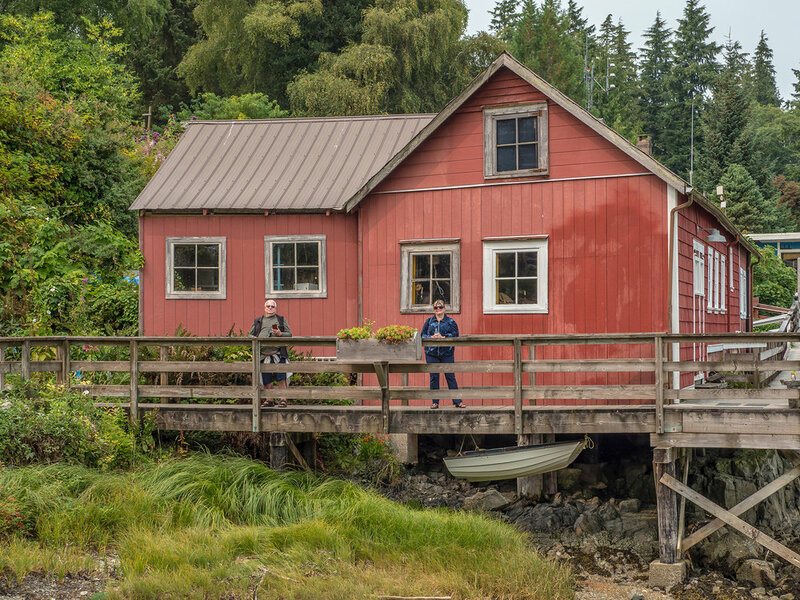 Bamfield is a small (pop 200) waterfront community with waterfront cottages connected by a cute picturesque boardwalk. On the way to Bamfield the ship docked at Sechart Lodge which is owned by the Lady Rose Marine company who operate the ship, some folk disembarked to either spend some quiet time at the lodge or to kayak among the Broken Islands. 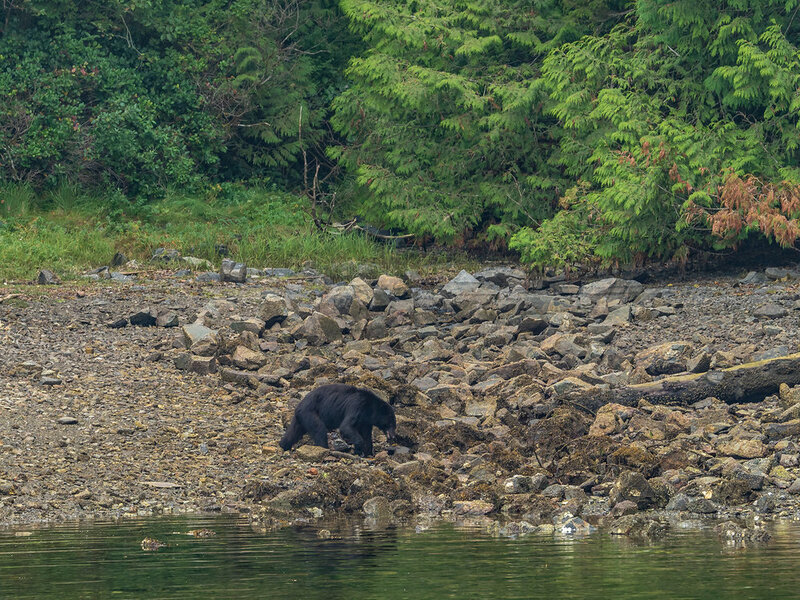 While we were docked at Sechart we were fortunate to see a small black bear among the rocks at the shore edge, he was oblivious to the action around him and continued to turn over the rocks looking for food, this is a good spot to stay for a few days and observe the wildlife close up. On we go on our way to Bamfield. We were able to get off the ship at Bamfield for an hour and a half, we walked along the boardwalk to a little bistro where we had a snack and a leisurely walk back to the dock. 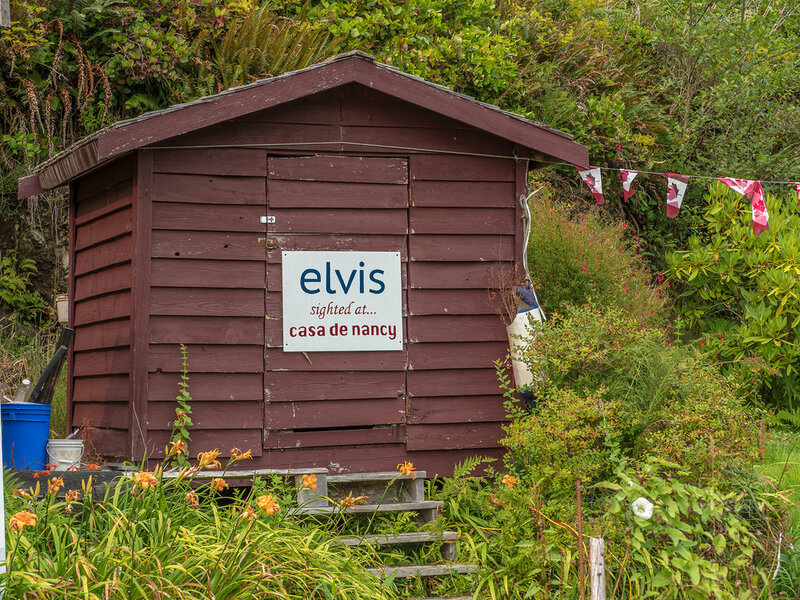 Along the boardwalk we came across a location visited by Elvis!!! you don't get to see that very often eh? It was a great day out but I would like to try it again on a clearer day, we did not get to see a lot of wildlife but I am told that you can regularly see wales, dolphins and eagles.